I write this sitting in my cushy new flat, on my fat double bed, with a chai tea latte and some bootleg internet. It’s pretty great. Getting here, however, has been far less comfy! 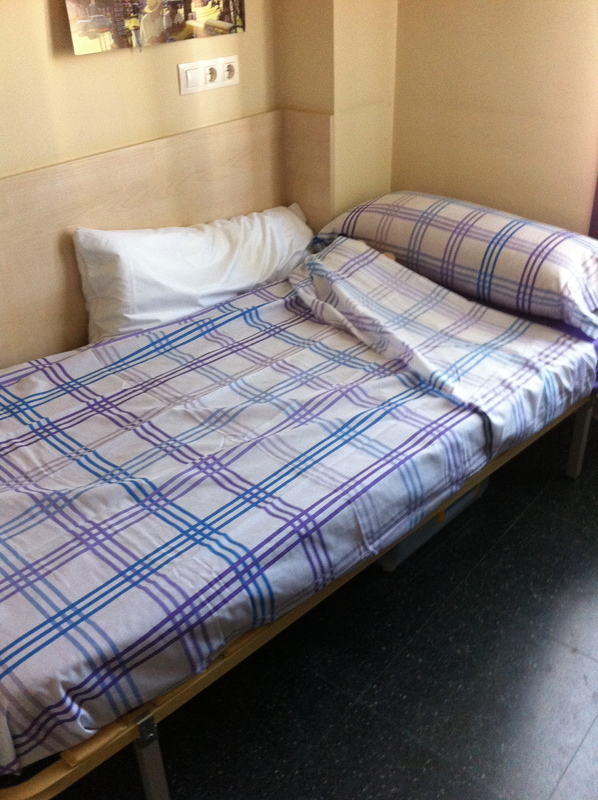 Arriving in Alcalá, I holed up in the university halls (RESA – Giner de Los Ríos), which I presumed would be cheaper than renting a flat in town. But you know, before even arriving, they had had 922€ off me (200€ for applying, and 722€ deposit). The room was nice, quite small, but then halls always are. Wee kitchen, with no oven (I nearly cried) but all other amenities present and correct. 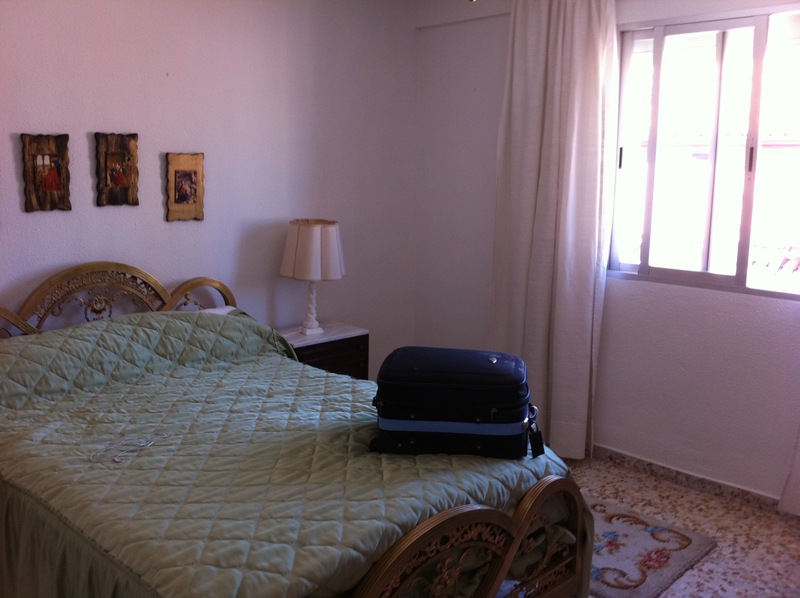 My bed at the residence – with bedding I had to buy myself! Rent was 460€ a month, not including bills, which were about 50€. So, for September they were asking for 510€, which didn’t include the laundry services, or crockery, or food! So I had to pay for all that, and the bus ride (1,1€) into town, where my classes were. This didn’t feel too bad; I comforted myself with the fact that at least I had somewhere secure to live, and it was nice, etc etc. I had a few niggles, like the fact that you weren’t allowed a guest to stay over without paying 15€ a night for a spare room, and I didn’t have anywhere to have people over for dinner (which is pretty much my life), but you know, I thought it would all work out OK. So then I start my course, which was the introductory ‘Let’s learn Spanish for the gazillionth time’ kind of shindig, so it was full of other Erasmus students from all over Europe. Conversation turned to where everyone was staying, which is when I started to get a bit worried. There was one girl who was staying about a three minute walk from the faculty, in a flat that was 300€ a month, before bills. Everyone was scandalised, and told her she ought to leave immediately and find somewhere more reasonable. And there was me sitting there, living a twenty minute bus ride out of town, and still paying nearly 200€ more a month than this girl who had (apparently) been totally ripped off. 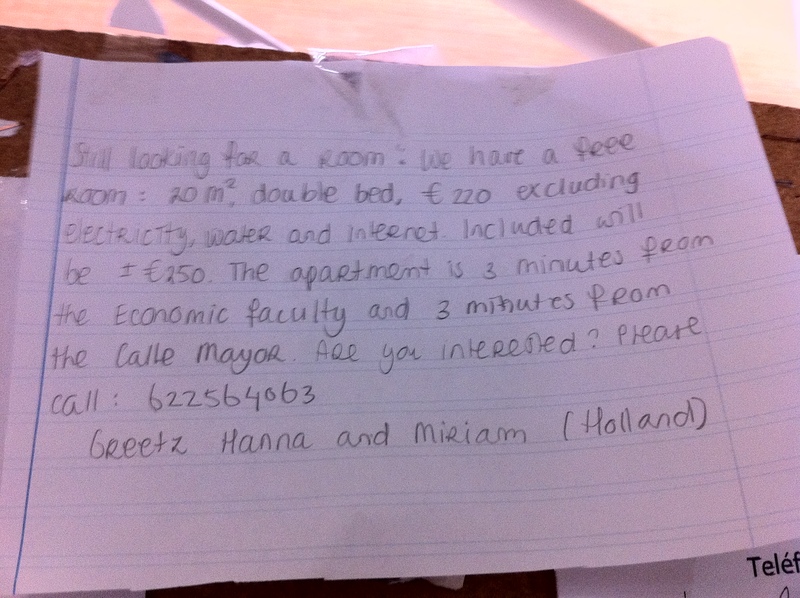 I went straight to the noticeboard in the faculty, which was littered with flat adverts. All the flats were between 190€ and 250€, all right in the centre of town! I started negotiations with the residence hall (which is pretty difficult in a different language – I spent the entire time on Google Translate making sure I had all the terms right) and found that, were I to leave, I would have to pay for the days I had stayed (fair enough) and forfeit my entire deposit – not so appealing. I had been there for two weeks at that point, and that two week stay had cost me 330€ in rent and bills, the non-refundable 200€ and the 722€ deposit. But, I worked out that if I found a flat less than 300€ a month overall, I would STILL save money by moving, so on Tuesday, I decided to do it. By then, everyone who had been looking for flats at the beginning of the course had found one, so I faced the daunting prospect of going it alone. But I mean, I moved to a foreign country to meet new people, so I manned up and went to take down flat details on the Wednesday. There was one ad that looked great: it was in English, which was a bit odd, but it was super close, 220€, with a massive room. I went to see it on the Thursday morning. It was two lovely Dutch girls who’d got a flat with this boy, who had turned out to be too tall for the bed, and had to leave. They didn’t speak much Spanish but spoke great English, so by Thursday night I said I would love to move in, and by Saturday afternoon I was here! My room here is lovely and light and big, with a built in wardrobe and pictures of Jesus everywhere (apparently the owners are this cute, old, fo’ sheez Catholic couple, who have taken their faith to the walls) and it’s just perfect. All for a mere 220€ a month! All in all, I WISH I had been brave enough to not sign up to anything in advance, and wait to see what was out here. I was a little too terrified that I would arrive and there would be no flats left! But, the most expensive lesson I will ever learn has been learnt, and I hope that I will NEVER pay more than 1200€ for a fortnight ever again!